WHITER TEETH is possible with…. CREST!.. This is something that can make you save a bomb yet achieve the same result as visiting a dentist!! A bright white smile is no longer a dream!! Not sure if you have heard this but I had read many positive review about it and seen result from a friend who had personally used it! I’m positive that I will love it! I bought my Crest from ebay! You can check out this seller (pegasstar) to get your Crest! Don’t ask me why I got it from her.. I just did! There are many other sellers provide more attractive info than her but.. I feel more secure with her (or a him??). The price range to pay for a Crest is quite about there, S$50nish.. Anything more than S$55 I would say it’s expensive! If you don’t feel save (yet) buying on ebay, you can visit Qoo10 too! It is easily available on Qoo10 already; there isn’t anyone selling 3D Crest on Qoo10 before! I think because it is really good, thus people are bringing it in! This Crest 3D White Whitestrips comes in many different type! *toothpaste is used for 4 weeks. Advanced Vivid Whitestrips give you a dramatically whiter smile in just 14 days. In fact, you’ll start seeing results in just 3 days. Advanced Seal technology provides a form fit, no slip grip that molds and adheres to your teeth for a better whitening experience. In fact, you can even drink water while wearing Whitestrips with Advanced Seal technology. Enamel Safe: All Crest 3D White Whitestrips use the same enamel safe whitening ingredient as the dentist. Why pay for Professional teeth whitening treatments? Crest 3D White Whitestrips Professional Effects is just as effective. These whitestrips are formulated with the same enamel-safe ingredient dentists use. Apply once a day for 30 minutes. You’ll start seeing a whiter smile after three days, with full results in 20. With Crest 3D White Whitestrips Intensive Professional Effects, you’ll get noticeable whitening after 1 treatment and full results in just 7 days. Crest 3D White Whitestrips Intensive Professional Effects are formulated with the same clinically proven ingredients dentists use. And since it also uses our groundbreaking Advanced Seal technology, you’ll get convenient, no-slip whitening. You can even drink water while you whiten! For daily maintenance and touch-ups in between whitening treatments. Ideal for protection against everyday stain buildup from things like coffee, tea, and wine. Crest 3D White Whitestrips 5 Minute Touch Ups gradually whiten your teeth. Use once a day for five minutes. These Whitestrips can also help you maintain your already white smile. Still not sure which is the one you want?? Well… Hopefully the comparison chart at the end of this post well helps you!! As for now… Let see how much the Advance Vivid can whiten my teeth! Advance Vivid comes in 14 pack – 14 days treatment! Instruction is also in the box! Hence no worry if are a first timer! Actually even if no instruction given, you can google for it! Everyone is raving about it.. (^_^) Probably I can just show you the “instruction” here (go straight to 3:15 if you just want the instructions)?? See.. Here’s my 14 pack and instruction! Each pack comes in a sheet like below, a strip for upper teeth and a curvy strip for lower teeth! The tooth whitening gel (contain peroxide) is at where the sticky part is..Peel off with care as it’s thin and quite flimsy and avoid having the strip sticking together.. WARNING: Continue if you can take it! 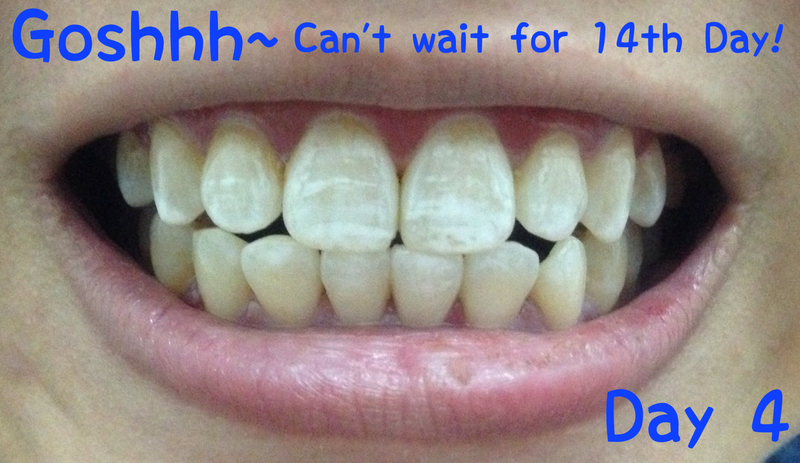 The pics are gonna be gross and… *gulp* Skip this post if you think you are gonna faint after seeing my yellow teeth!! I swear I have very yellow teeth! So here… This is my Day 1 pic! Sorry! It was after I put on the lower strip then I realize I forgot to snap a “before” pic!! So better than nothing, here’s a half-before pic! I read a few post saying that they felt that sensitive sensation when applying the strips. Hence I prepared myself for that “nightmare” ( I have sensitive teeth!). Other then that i was worried that I will not dare to swallow my saliva when I’m on these strip (I had another teeth whitening product that is so gross that I hardly use them)! Apparently, these whitening strips are amazing! Put is on easily, like sticker! No sensitive sensation!! Swallow saliva? Of course! Even drinking water is no problem!! It is a totally easy 30 minutes process!! Yup!! I’m very happy with my Day 1 result! I achieve whiter (partly) teeth effortlessly!! This made me wanna do it again on Day 2!! Just like Day 1, everything was fine!! Easy 30 minutes! In fact, because I was doing some work, I had them on for almost 45 minutes! OoPs! Day 3? I tried putting on the strip nearer to my gums to see if I will get the sensitive sensation.. Hmm.. With the strip nearer to my gums, I can indeed feel the sensitive sensation but it ain’t that crazy pain. Just keep your mind on other stuff and you will forget about the pain. Results seems quite stagnant already huh? Not really..! From what I see, I can tell that some teeth did gets whiter. Now I can’t wait for the 14th day to see a whiter set of teeth!!! I will update this post again (to show you the 14th day result!) when I’m done with the whole treatment!! If you already wanna try one set yourself but don’t know which one should you be getting, below is a chart that’s pretty helpful!! I suppose if you want are serious about teeth whitening and want a speedy result, “Intensive Professional Effect” should be the one for you! If you have sensitive teeth, you might one to consider “Gentle Routine”. 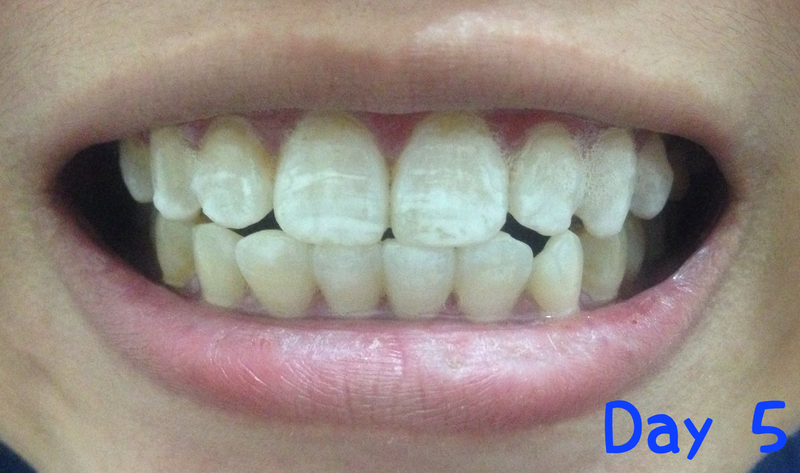 Although the treatment is long but whiter teeth is still possible! I will update this post again so…. stay tune for my FINAL RESULT!! YEAHHHHH!! Firstly, sorry for the SUPER LATE update!! Been SOO tight up! So I had stopped at day 3 ya?? Now I’ll show you the rest…. …… Actually there’s not much the rest… I only shoot till “day 6” because the result were stagnant after then… IMO, results indeed varies! 😦 My yellow teeth got better slightly as compared to the first day but ain’t any closer to the pearlie white teeth! So if you are lookng forward to those ads white teeth, you need to be more hardworking! BRUSH YOUR TEETH after every meal please!! Perhaps I can consider doing the LED treatment – another lazy way?? Geez! 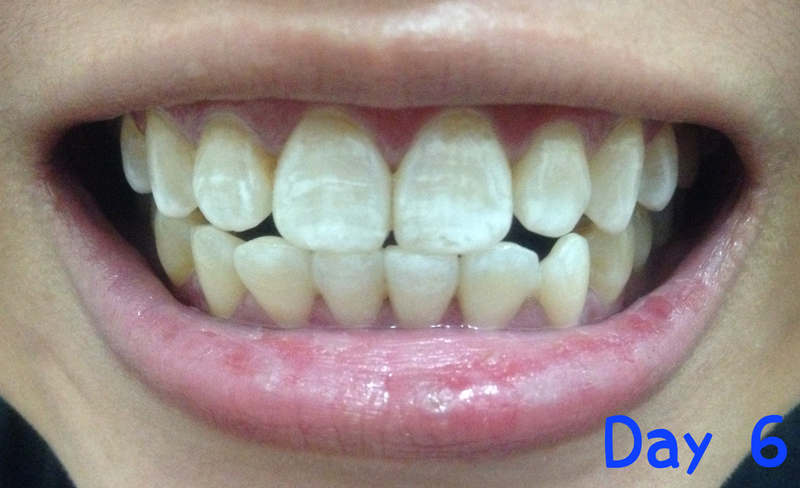 This entry was posted in .Care for Oral, Crest and tagged Teeth whitening by Tempted to Love. Bookmark the permalink. It is important to keep your teeth white and healthy even if you are smoking.